RTA Locus Sketch Plans & Photography. We act for solicitors through the UK to gather evidence on road traffic accidents to either support or disprove a claim. 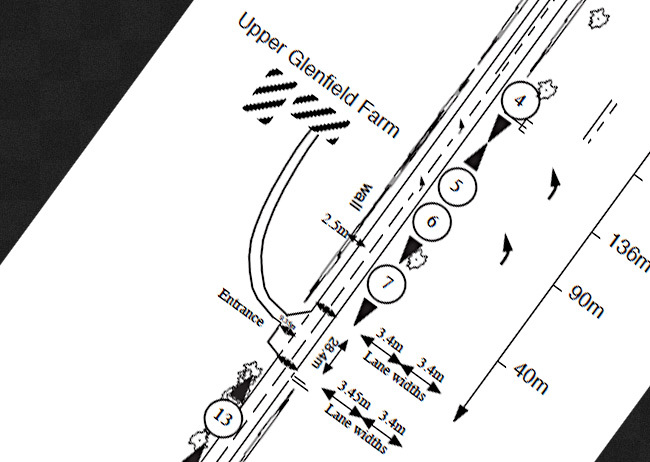 when preparing A RTA Locus sketch plan report we will visit the accident scene and compile all the necessary evidence and information for the RTA locus plan. The plan would show in particular - Clients approach, third party approach, the position and distances where each photograph was taken, road markings, street lighting / furniture and acccurate detailed measurements. Our investigative support services will then prepare the report. The report inc a CAD sketch plan, photographs and photographic index. CAD sketch plans,presented in bound booklets, x5 booklets supplied. Other photographic /plans combinations available. Our photographic legal services are used primary used by the legal profession where visual photographic evidence is required by solicitors and their clients personal injuries.. Please telephone us or contact us below with a email form - we will contact within 24 hours. Copyright © ASL Legal Services - All rights reserved.